Gypsy Balkan Brass legends who spent decades playing weddings, funerals and festivals before winning over the West. Right now Fanfare Ciocarlia stand as the hardest working band in the blow biz, heavyweight champions whose wit, groove, ferocious technique and ability to deliver fresh sounds marks them out above all others. The brass orkestar from Europe’s frayed edges have created a musical feast like no one else for the last decade. The legend of Fanfare Ciocarlia begins in the “invisible” Gypsy village of Zece Prajini in north-west Romania. For generations the village’s men farmed and made music, playing local weddings, funerals and festivals. In 1996 Henry Ernst, a German sound engineer, chanced upon Zeci Prajini’s musicians and, realising he had stumbled on hidden musical treasure, took the village orkestar to Berlin. An instant hit, Fanfare’s brass attack soon conquered Western Europe, North America, Japan, Brazil, Mexico, Australia, Russia, Israel and – in 2006 – Romania. Nine albums (inlcuding Radio Pascani, Baro Baro, Iag Bari, Gili Garabdi) and a DVD (The Story Of The Band) have established Fanfare Ciocarlia not only as the hottest Balkan Gypsy band but as musical Mohammed Ali’s, masters of a heavy, heavy monster sound, purveyors of a unique Eastern funk. Steeped in tradition yet absolutely contemporary, Fanfare have not only won over world music fans but also count rockers, ravers and jazz fans amongst their audience. Revered for their ability to impress on concert hall stages and rock dance clubs, the eleven-piece brass orkestar serve up ancient Oriental grooves dusted with secret Gypsy flavours. 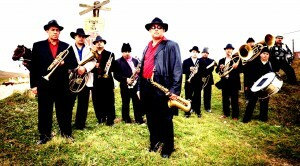 Fanfare’s success has inspired many imitators and their raging dance groove launched the Balkan Beats club craze. Right now they remain the planet’s premier brass band: the biggest, loudest, most entertaining outfit on twenty two legs anywhere. Put simply, Fanfare Ciocarlia are as much fun as you can have with your clothes on. 2006 found Fanfare winning BBC Radio 3’s Planet Award for European Artists and being commissioned by Sacha Baron Cohen to record Born To Be Wild for the Borat soundtrack. The band’s patriarch Ioan Ivancea died last October after a long illness, inspiring the band to record Queens & Kings, an album cut with legendary Gypsy musicians from across Europe.